Abraham dropped us off near a small airstrip, where we were met by Jakes, one of the guides from Mashatu Tented Camp, driving a Toyota Landcruiser. He immediately asked us which we liked better, the Landrover or the Landcruiser � we told him we would have to reserve judgment until we had spent more time in the Landcruiser. 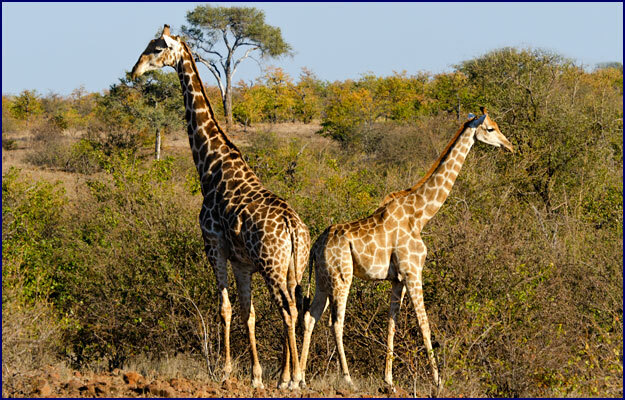 The Mashatu Game Reserve adjoins the Tuli Lodge area, but is far larger, around 75,000 acres. 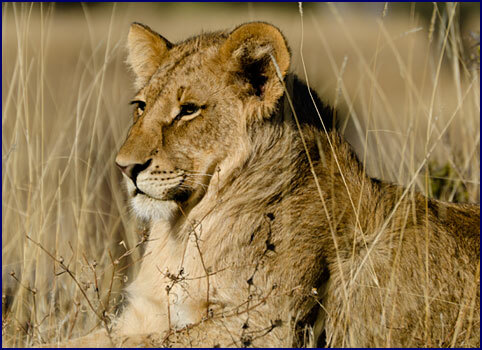 Both are privately owned properties that are part of the greater Northern Tuli Game Reserve, which encompasses the very eastern-most tip of Botswana. Jakes drove for almost an hour on the bumpy washboard gravel road, and he was moving right along. At one junction there was an arrow pointing to our turnoff and a handmade sign labeled M1 � a tongue and cheek reference to the major British motorway with the same designation. We drove through the bushveld, across flat barren plains. After a while the landscape became more rolling, with denser brush and many big trees. The hillier countryside was beautiful, and we crossed several small rivers. It seemed to be the Land of the Giraffes; there were two big ones right in the road, and dozens of others along the way. We were excited about this, because so far we had not spent as much time with giraffes as we would have liked. We arrived at the Mashatu Tented Camp, where we were greeted by an older Motswana gentleman named Congo. He gave us a welcome drink, and took us up a little path through the woods to Tent Number 1, which would be our home for the next three days. It was a canvas tent set on a permanent concrete platform, with a small verandah in front and a bathroom and shower out back. It was very nice, with electricity, running water, decent beds, nightstands, and a dresser. Congo told us to keep the tent flap zipped tightly to keep the monkeys out, and to put our valuables and toiletry in the dresser drawers in case they got in anyway. We noticed right away that our tent zipper wouldn�t actually fasten; we hoped this wouldn�t be a problem. There was an electric fence around the camp, which we were told would hopefully keep out the elephants, but would not deter lions and hyenas. We were instructed not to leave our tents during the night. Each tent room was equipped with an air horn in case of emergency; the information sheet in our rooms said that animals outside your tent do not constitute an emergency; animals in your tent do. We unpacked our bags and went outside to explore. We paid our respects to a bushbuck that lay in the underbrush just a few feet from our door, unconcerned by our presence. We went down a path to a gate in the perimeter fence, and then crossed the dry streambed between high protective stone walls to the Hide, a camouflaged shelter built beside a water hole, where one can sit and observe the animals as they come to drink. There were several serious looking photographers there; we quietly sat down in the empty chairs, and waited and watched. A herd of impala came down for water; they seemed to sense our presence and were wary at first, but soon seemed to gain confidence from safety in numbers. At three o'clock we went to the lounge for high tea. This open-sided building of rustic wood and thatched roof housed the bar, the sitting area, and the dining room where brunch and tea were served. We met our guide, Justice, a friendly Motswana who seemed to have a genuine passion for the animals and the bush. The day was warm and the sky was a deep clear blue as we set off on a game drive with Justice through the beautiful rolling countryside. The Toyota Landcruiser was similar to the �rovers, with three bench seats and no roof. The seats were a bit further from the ground than the �rover, and Justice hung a little portable ladder from the side of the vehicle to assist us in climbing up. A couple from Kentucky joined us, and a spotter named Ephraim rode in the back seat to assist in finding wildlife. We drove out the back of the camp, past the watering hole. The first thing we found was a boomslang in a tree. This highly poisonous greyish-green snake has potent venom, more toxic than mambas and cobras. I think boomslang is a great name for a snake! 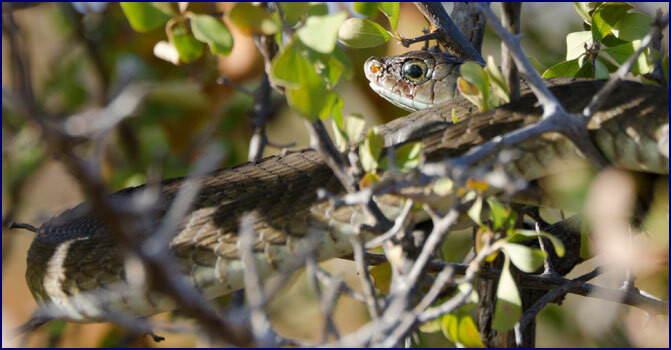 It was camouflaged in a mopane tree, and we were able to drive the vehicle to within inches of it, for an eye-to-eye encounter. We saw all of the usual suspects: impala, zebra, wildebeest, eland, steenbok, warthogs and baboons. Justice told us that the zebra and wildebeest often hang out together, because zebras see really well and wildebeests have very keen hearing, so together they make a good team. In the bird department, there were plenty of francolins (also known as spurfowl), guinea fowl, Cape turtle doves, and hornbills both yellow and red billed. We saw several giraffes, but only in the distance. Justice got word on his radio of a cheetah sighting, and we went to find them. There were three adult males, all brothers, starting to hunt. We watched as they stalked regally across the plain. Cheetahs are exceptionally elegant. 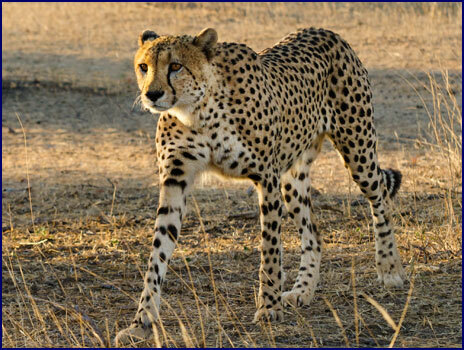 They are long and lanky, built for speed � the feline version of a greyhound. Justice drove the �cruiser ahead of them and stopped, so we could watch and photograph them as they strolled by; he repeated this drill several times. The cheetahs disdainfully ignored us, like stars too used to paparazzi. They stopped several times to mark their territory, spraying scent on trees. They worked their way up a long slope to the top of a narrow ridge, where was a breathtaking panoramic view of the plains below. 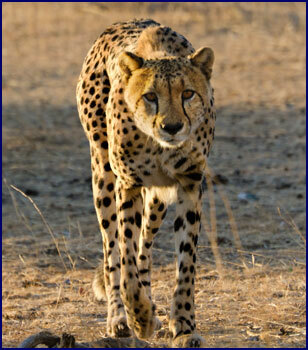 Justice told us that cheetahs often spot their prey from this ridge, which was appropriately named Cheetah Hill. The sun was getting low and the evening sky was turning pastel colors. A nearly full moon hung pale above the horizon. We left the cheetahs to their hunt and moved on. We postponed Sundowners in favor of leopard hunting. Justice drove alongside a woodsy creek in the gathering darkness. 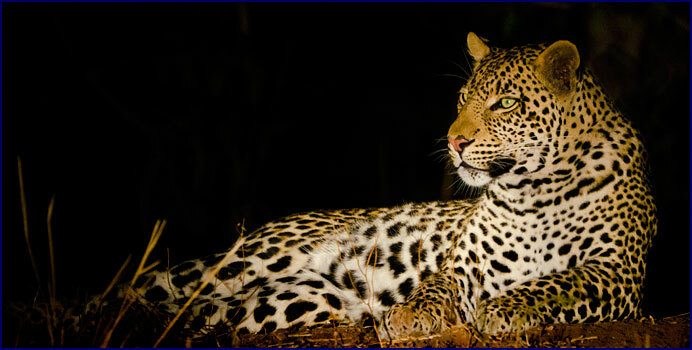 We spotted a leopard, walking along the bank of the dry creek; he soon lay down and started grooming himself. It was getting quite dark, but our spotter Ephraim shone the light on him so we could get photos. As we maneuvered closer he sat up and stared at us intently, but after a while he seemed to lose interest. His eyelids started to droop, and before long he flopped down on his side for a snooze. We carried on, spotlighting along the way. We stopped for a late Sundowners, with white wine and homemade potato chips. The moon bathed the landscape in a soft glow, the silky light transforming the plain to a shimmering silver. It looked like a lovely night for a walk. I stood with Mike, the man from Kentucky, and we fantasized about hiking by moonlight across the plain to the top of the far hill � we could sneak off when the guides weren�t looking. I wondered how far we would get. Even with the moonlight, the stars were brilliant above us. Justice pointed out the Southern Cross and the two bright Pointer stars aligned next to it. We could see the constellation Scorpius in full, high in the sky instead of obscured by the horizon like it usually appears at home. We arrived back at the camp at 7:15, where Congo met us with lanterns and escorted us to our tents. Dinner was served in the boma, a circular enclosure surrounded by a high solid wooden fence. As at Tuli, the server announced the fare: Lamb and beef, potatoes, couscous, veggies and mashed pumpkin. It turns out that mashed pumpkin is surprisingly good! But I did note that they served �lamb� for dinner often, but I have yet to see a sheep in Africa. The air was clear, and very cold. We sat close to the fire for warmth. They served Cointreau after dinner, pouring triple shots of the delicious orange liqueur. Heading back to our tent, we found our path lit by storm lanterns. The temperature was dropping quickly and there was no heat source in our tent, though we were supplied with plenty of thick warm blankets. But to our delight, we found that hot water bottles had been placed in our beds. Crawling under the covers with the hot water bottles and multiple heavy blankets, we were very cozy. Our guide woke us at six, and it was freezing � the coldest morning we�d had yet by far. I put on pretty much all the clothes I had brought � three shirts, a windbreaker, a polar fleece and a heavy rain jacket, along with a winter hat and gloves. Lacking long johns, I wore my pajamas underneath my pants. Jineen, who gets cold more easily than I, was wearing even more layers. Pack light, right? Hah! After all, its Africa � how cold can it be! After a quick cup of hot tea, we set out on the game drive at 6:30. Climbing into the Landcruiser, we were gratified to find heavy blankets waiting for us on the seats, and even better, a hot water bottle for each of us. There were eight guests crowded into the vehicle this morning, as well as the guide and spotter � it was packed, but at least we were warm. Driving out across the savannah, we watched the sun come up in a blaze of orange. A chorus of bird song greeted the translucent morning sky. We saw zebras in the half light of dawn, and impala faded away into the bushveld before us. We met up with elephants almost right away. It was a large group, at least twenty, with two very small babies. They made their way through the bush, moving purposefully. Justice drove ahead of them and stopped strategically by their path; they swerved past us and kept going, the adults surrounding the little ones to shield them from our view. Justice again maneuvered the vehicle ahead of the herd, and we watched them close up as they strode by. One large female, the herd matriarch, became increasingly annoyed with us. After several warnings she finally charged the jeep, with her ears flapping and her trunk held high, trumpeting as she came. She did not charge particularly fast, seeming content to just chase us away rather than flatten us, but she was persistent, following us for at least half a mile even after we retreated. Justice told us later that this was a �mock charge.� When the elephant�s intent is serious, they charge with their ears pinned back and their trunks tucked underneath. Good to know. We stopped on a knoll for a cup of tea, with a wide view of the bushveld around us. I took panoramic photos of the stately procession of elephants as they moved across the plain, blending into their surroundings amazingly well. Moving on, we came across some of the regulars; wildebeests, giraffes, warthogs and ostriches. We saw a mother zebra with very unusual markings; her neck and back were covered with intermingled stripes and spots, though the baby at her side had a normal striped pattern. A lilac-breasted roller bird flew across in front of us, the sun highlighting the iridescent blue of its wings. We saw a couple of new birds � the attractive blue-black Burchell�s starling, and the brilliant crimson-breasted shrike. So far, every day we had found at least one new species of animal or bird that we hadn�t seen before. 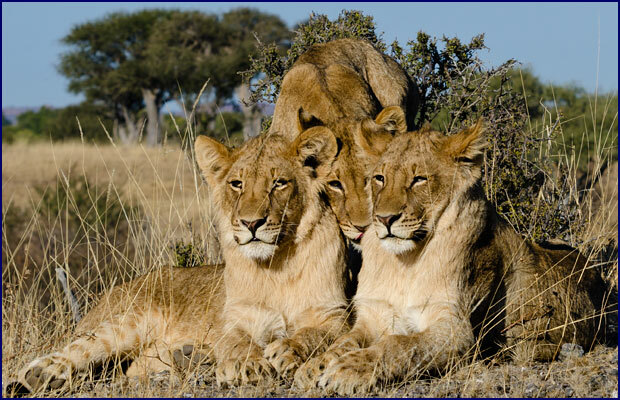 We came across another Land cruiser, parked on the open plain; stopping to investigate, we found to our delight that the occupants were watching a pride of seven lions. 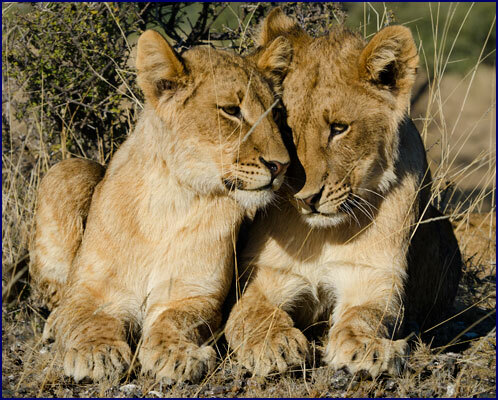 There were two adult females, three older cubs which Justice said were probably nine months of age, and two smaller ones, about six months old. 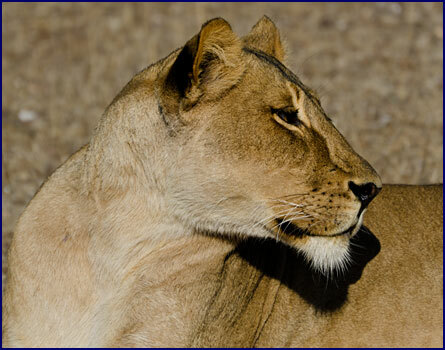 One of the lionesses lay daydreaming in the sunshine, and the other walked regally across the clearing, her lithe body all grace and power, tawny coat gleaming in the sun. Neither of them acknowledged our presence, but Justice said if we got out of the vehicle they would probably kill us. We decided not to test the theory. For that matter, with the totally open �cruisers, there seemed no reason they couldn�t kill us while we were in the vehicle if they wanted to . . . The cubs were extremely cute, though I am sure they were hoping for a description more like fierce or majestic. They had thicker coats than their mothers, almost a little fluffy, and they were darker colored, with mottled spots. Several of the older cubs were males, and we could see the scruffy beginnings of manes around their necks. The youngsters stalked about, looking for trouble and getting into mischief; kittens are kittens the world over. Two of them chewed on a bush, looking not in the least kingly. After a while they all meandered over to a knoll and posed for us. Two of the older cubs were lying side by side facing us, and the third, wanting in on the act, squeezed in right between them. All three of them gazed at us, hamming it up for the camera. Eventually we moved on. 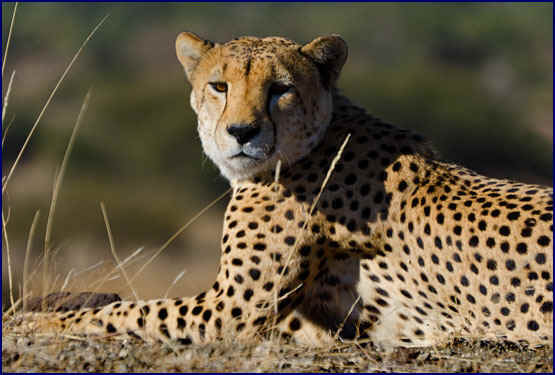 We drove up to the top of a knoll to find three cheetahs, the brothers from the night before, sleeping in the sunshine. They briefly raised their heads to check us out, and then went back to their nap. We drove along beside a riverbed, and found a large adult male lion, resting in the shade. He had a thick dark-colored mane, and one eye was blind. He looked venerable and old, battle-tested, and he wore his scars with pride. We were headed back to camp, checking out a few zebras and elephants, when Justice got a report on the radio that there was a leopard in the area. We drove along the dry riverbed to where it had been sighted. After a fair bit of searching, we saw a female leopard walking furtively through the underbrush, and we got a mere glimpse of her two half grown babies. We reflected on what a great morning it had been - lions, cheetahs and leopards, all in the space of an hour. We arrived back at the tented camp at 11:15, just in time for brunch in the dining hall with the other guests. We spent some time getting to know Jennifer and John from New York, who had visited Mashatu before. 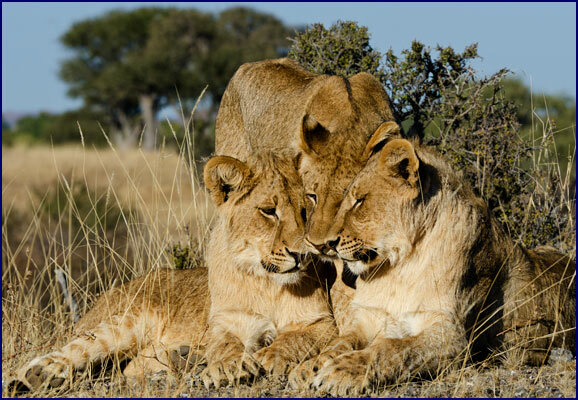 John had broken his back in six places several years before, and now lived on a morphine pump � even though he had ridden up front beside the driver on the morning game drive, the constant bumping on the rough tracks had done him in. After lunch we sat on the front porch of the tent and threw crumbs to the birds. We got out our bird book and identified an arrow-marked babbler, a green-backed camaroptera, a tropical bou bou, some white-throated robin chats, and several red-eyed bulbuls. We walked down the little path between the stone walls to the Hide, and watched to see what would come to the waterhole. Before long a herd of female impala came down from the hillside. 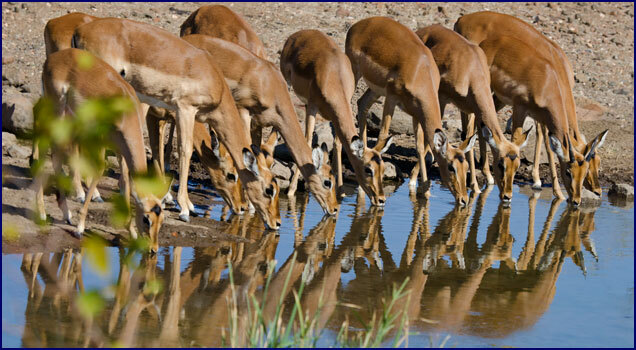 They stood side by side as they bent down to drink, their graceful heads mirrored in the reflection on the water. Soon after they finished, a bachelor herd of males came, sporting impressive sets of long curving horns. John Spence from Aardvark Safaris had told me we would enjoy the Hide, and he was right. We stayed there for several hours, fascinated. We identified some more birds: the golden-breasted bunting, the cinnamon-breasted bunting, and a brilliant little turquoise bird called the blue waxbill. We�d seen enough new species this afternoon to last a week! Presently two big male kudus walked by on the far side of the clearing. 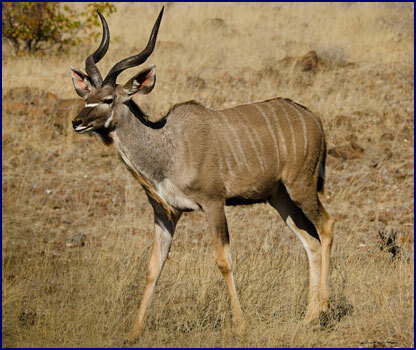 Kudus are my favorite of the antelopes, tall and graceful, with elegant faces and huge cupped ears. They are a greyish-brown color, with thin vertical white stripes on their sides. They have a fringe of long mane all the way down their spines, and also on the underneath side of their necks. 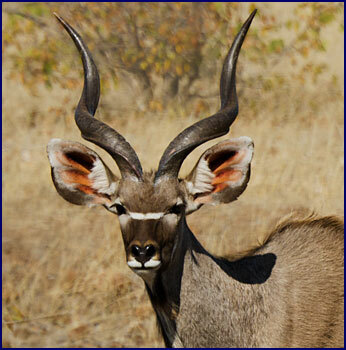 The males have magnificent long twisting horns. The kudus seemed to be considering coming down to drink, but they sensed our presence and kept going, fading away into the bush. Upon returning to our tent, we found that the faulty zipper on the tent flap had been replaced, making it monkey-proof. Pretty good service, considering we had just mentioned it that morning. High tea was served at three o'clock, and then we went out for the afternoon game drive at 3:30. Only four guests this time, much less crowded. John and Jennifer sat this one out because of John�s back, but we were joined by Xavier and Bircee from Belgium. Xavier was a very keen photographer; he took pictures of everything. I thought I took a lot of photos, but Xavier took more. Justice drove, and Ephraim was our spotter again. When we were at Tuli Lodge we never had spotters on the drives, even though the Landrovers had been equipped with a special seat for them out on the front of the vehicle. Here at Mashatu Ephraim went out as spotter on every drive, sitting in the back. We came to a lovely large water hole formed by a dammed up river. 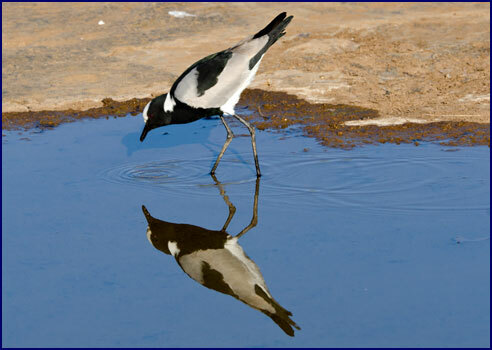 A blacksmith plover waded in the shallows, his black, grey and white plumage vivid in the sunlight. A chorus of doves� voices filled the air: Botswana, Botswana, Botswana. We stopped beneath a great baobab tree, and Justice picked one of the fruits for us to taste; it was sort of like a nut, but bitter because it was not yet ripe. He told us that the baobabs have a very soft, pulp-like wood, and when they die they sort of implode, and rot away very quickly. They have a very high water content, up to 60%, and the trunks actually swell and shrink with the wet and dry seasons. 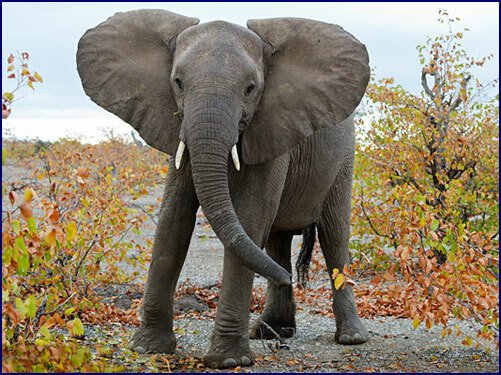 We found elephants � a herd of about twenty, traveling along a dry riverbed. We parked in the direction they were heading toward, and waited as they came closer. Unafraid, they trooped right past our �cruiser, some of them passing within 15 feet of us. 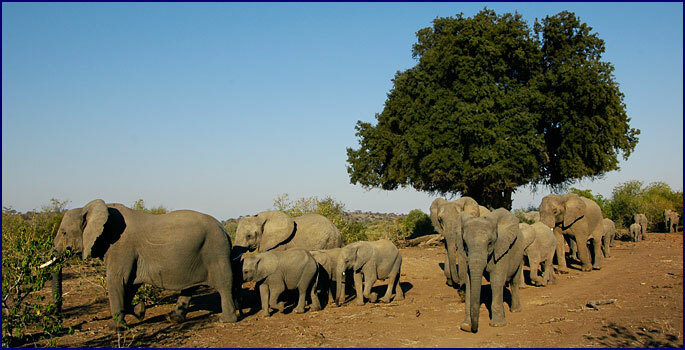 They stopped to eat, tearing the leaves and branches off of the mopane trees with their trunks and devouring them. Justice explained how the mopane trees actually release a pheromone when the elephants start eating them, which causes the other trees downwind to turn bitter to the taste. Some of the elephants went to the riverbed and dug down through the dry sand to find water underneath, drinking, and spraying themselves a little. They were joined by another group from up the river. Continuing on, the Landcruiser became briefly stuck in the deep sand of the dry river bottom; with wheels spinning madly, Justice managed to get it free. Regarding the question of Landrovers versus Landcruisers, by now we had enough data to answer the question. The �cruisers at Mashatu had more legroom and space for our backpacks and camera equipment, and so were a little more comfortable. But they also had less ground clearance, and seemed to get stuck more often. The �rovers from Tuli seemed to be more rugged and could go over steeper terrain. Overall, we voted in favor of the Landrovers. 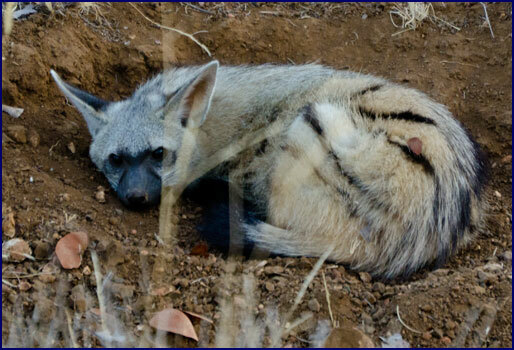 As the daylight was fading, Justice suddenly pulled off the road; there was an aardwolf, curled up sleeping in a shallow ditch. It looked somewhat foxlike, with large ears and a striped coat. Justice told us that these more attractive relatives of the hyena are totally nocturnal and quite rare, so we were really lucky to see one. We had Sundowners on a small hill � white wine and popcorn. The sun set in a blaze of fire, its reflected light creating a brilliant border of orange and rose, like a rainbow all the way around the horizon. The full moon hung orange in the sky opposite the sun. Justice and I talked as we watched the stars come out one by one. With his keen eyes, he could see each new star sooner than I could. We watched the Southern Cross and Scorpius gradually appear in the sky, growing more brilliant as the night darkened. The Milky Way was strewn like jewels across the heavens. I asked Justice if he loves his job, and if he realizes how lucky he is to live in a place surrounded by beauty and nature. He said yes, he does, very much so. I told him about my own job, and how much I love it. We stood in companionship, sharing the timeless moment. We spotlighted our way back to the camp, seeing only a few zebras, a couple of elephants, and some wildebeest. Congo met us with the lantern and escorted us to the boma for dinner. There were about a dozen guests staying at the Tented Camp, and the tables were set in a semi-circle around the fire. The main course was goat; why is it that we had a choice of at least two entr�es every night except for when they served goat? John let me borrow his international cell phone to call home, the only time I was able to do so for the entire trip. After dinner we all sat around the campfire and listened to the guides tell stories, sipping on Cointreau and moving our chairs closer to the flames for warmth. It was a friendly group, and very good company. I commented to Jineen that there never seems to be any jerks staying in the camps in Africa. By and large, the guests are kind and considerate. Everyone is there with a common interest and a love of nature, and by and large everybody gets along well. Looking up from the fire, we saw a sleek body move suddenly across the serving table. It was a genet on the tabletop, lapping up the milk for the tea. Genets have cute kittenish faces, lithe spotted bodies and outrageously long striped tails. They are very agile and quick, and are excellent climbers. Though commonly called genet cats, they are not actually feline, but rather are related to the civet. This one was apparently a regular visitor at the boma � the serving ladies chased it away with a shout. As the fire burned low, it looked like shining lights were emanating from the trees above us. At first I thought it was glow worms, but it was just the reflection of the moonlight on the leaves. As our eyes seemed to be playing tricks on us, it was time for bed. Following the path through the trees to our tent, Jineen accidentally kicked over the hurricane lantern marking the way. We could hear the distant sound of a hyena calling in the night.